SEO is an iterative process. You need to keep abreast of multiple ranking factors and their potential weighting in proprietary search engine algorithm updates. 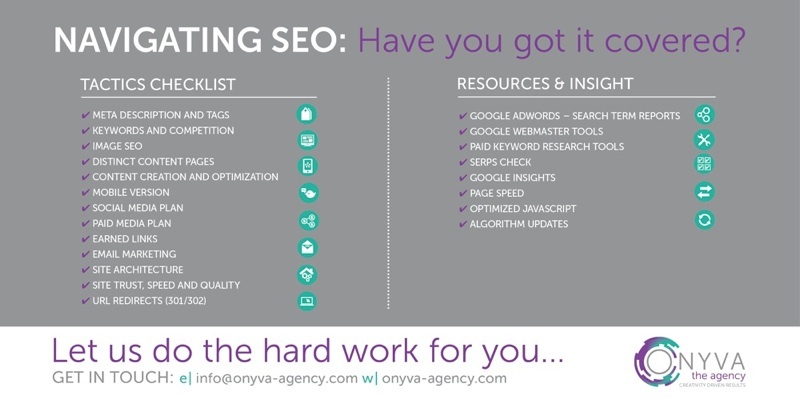 Our infographic provides a straight-forward SEO checklist into tactics and resources, to ensure you’ve got the key things covered. What are your goals for SEO, and how much budget do you have to assign to it? What are customers searching for, to find your product or services? If the answer here is “we are not sure,” or “we are subjectively guessing what it is,”, you will need to dedicate time for search term and keyword research. When you’re marketing B2B, as a life sciences, biotechnology, medical or tech company, you’ll undoubtedly have considerable in-house expertise. As a result, it can be tempting to second guess and assume you know how a customer will behave. Whilst, your specialist knowledge will serve you well, we’ve encountered many instances where clients have been surprised to learn how their users are finding their products. Remember, subtle differences and variations in keywords can have a profound impact on SEO. Keyword research tools (e.g Google Keyword Planner , Moz’s Keyword explorer and SEM Rush, to name a few, can be a huge help. Tie these in with information from search term reports from PPC, Google Trends , or other similar tools and you have a great start. One issue you may face in a B2B environment with specialised products, is a lack of search volume for definitive data. One approach here would be to supplement data with direct user interactions from focus groups or surveys. What keywords do you want to rank highly for? What are competitors ranking highly for? Are you tying in your SEO research with a content marketing and distribution plan, relevant for your target customers? Will it help you earn inbound links? Whose linking to your competitors? Do you have a social media plan? How are you going to measure success? What metrics are key? Still need more help with implementing website SEO? We offer a comprehensive service to help improve search rankings. Get in touch with our team now.